The World Chess Championship 1984 was a match between challenger Garry Kasparov and defending champion Anatoly Karpov in Moscow from 10 September 1984 to 15 February 1985 for the World Chess Championship title. After 5 months and 48 games, the match was abandoned in controversial circumstances with Karpov leading five wins to three (with 40 draws), and replayed in the World Chess Championship 1985. Three Interzonal tournaments were held. The top two finishers in each qualified. Zoltán Ribli won the Las Palmas Interzonal ahead of 62-year-old former World Champion Vasily Smyslov. Kasparov, aged 19 years old at the time, won the Moscow Interzonal by a convincing 1½ point margin ahead of Alexander Beliavsky. The Toluca Interzonal was won jointly by Lajos Portisch and Eugenio Torre. Tal and Andersson contested a playoff in Malmö for a reserve spot for the Candidates Tournament. The match ended 3–3; Tal became first reserve because of his better tie break score in the main event, but eventually no reserves were needed. The six Interzonal qualifiers were joined by Viktor Korchnoi and Robert Hübner, the Candidates finalists from the previous cycle (World Chess Championship 1981). The eight players participated in a series of knockout matches. The winner was Garry Kasparov. The Smyslov–Hübner match was originally tied at 5–5. After playing four extra games without breaking the tie, the match was resolved by a spin of the roulette wheel. Politics threatened Kasparov's semi-final match against Viktor Korchnoi, which was scheduled to be played in Pasadena, California. Korchnoi had defected from the Soviet Union in 1976, and was at that time the strongest active non-Soviet player. Various political manoeuvres prevented Kasparov from playing Korchnoi in the United States, and Kasparov forfeited the match. This was resolved when Korchnoi agreed for the match to be replayed in London, along with the Vasily Smyslov vs. Zoltán Ribli match. The Korchnoi–Kasparov match was put together on short notice by Raymond Keene. Kasparov lost the first game, but subsequently won four, prevailing in the match with a total score of 7–4. The championship match between Karpov and Kasparov had many ups and downs, and a very controversial finish. Karpov started in very good form, and after nine games Kasparov was down 4–0 in a "first to six wins" match. Fellow players predicted he would be whitewashed 6–0 within 18 games. But Kasparov dug in and battled Karpov to 17 successive draws. He lost game 27, then fought back with another series of draws until game 32, his first-ever win against the World Champion. Another 14 successive draws followed, through game 46. The previous record length for a world title match had been 34 games, the 1927 match between José Capablanca and Alexander Alekhine. Games 47 and 48 were both won by the challenger, making the score 5–3 in favor of Karpov and the eventual outcome far less certain. Then the match was ended without result by Florencio Campomanes, the President of the World Chess Federation, and a new match was announced to start a few months later. The termination was controversial, as both players stated that they preferred the match to continue. Announcing his decision at a press conference, Campomanes cited the health of the players, which had been strained by the length of the match (5 months: 10 September 1984 to 8 February 1985). The match became the first, and so far only, world championship match to be abandoned without result. The restarted match (the World Chess Championship 1985) was best of 24, with the champion (Karpov) to retain his title if the match was tied 12–12. Because Karpov's two-point lead from the 1984 match was wiped out, Karpov was granted the right of a return match (the World Chess Championship 1986) if he lost. ^ World Chess Championship : 1982-84 cycle : 1982 Las Palmas Interzonal. Mark-weeks.com. Retrieved on 1 July 2016. 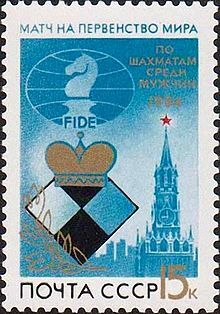 ^ World Chess Championship : 1982-84 cycle : 1982 Moscow Interzonal. Mark-weeks.com. Retrieved on 1 July 2016. ^ World Chess Championship : 1982-84 cycle : 1982 Toluca Interzonal. Mark-weeks.com. Retrieved on 1 July 2016. ^ World Chess Championship : 1982-84 cycle : Candidates Matches. Mark-weeks.com. Retrieved on 1 July 2016. ^ Byrne, Robert T. (8 May 1983) Chess - Should Chance Decide The Outcome Of A Match?. NYTimes.com. Retrieved on 2016-07-01. This page was last edited on 26 November 2018, at 06:13 (UTC).